On Saturday, August 3 at 1948 UT the Japanese HTV-4 cargo vessel was successfully launched to the International Space Station (ISS). On-board were the HamTV transmitter and four CubeSats carrying amateur radio payloads. 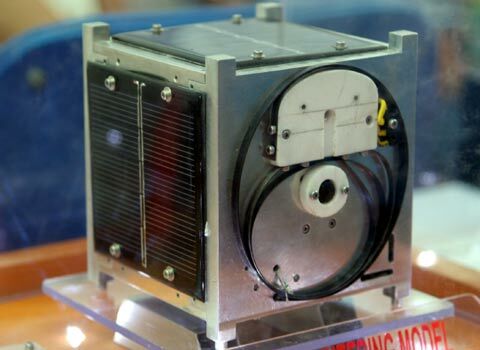 • PicoDragon a 1U CubeSat developed by Vietnam National Satellite Center (VNSC), University of Tokyo and IHI aerospace. 437.250 MHz CW beacon and 437.365 MHz 1200 bps AFSK AX.25 telemetry. • ArduSat-1 developed by NanoSatisfi. 437.325 MHz 9k6 MSK CCSDS downlink. • ArduSat-X developed by NanoSatisfi. 437.345 MHz 9k6 MSK CCSDS downlink . The company NanoRack has announced it is sending 36 Units of CubeSats to the ISS (believed to be 26 separate CubeSats, some 2U or 3U in size). At the time of writing it is believed they will be going on a later cargo vessel. The HamTV transmitter is the culmination of over ten years work to establish an amateur radio TV transmitter on the ISS. It will use patch antennas fixed on the Meteorite Debris Panels (MDP) protecting the hull of the ISS Columbus module. These antennas were installed while Columbus was being constructed. A fund-raising campaign took place during 2005-7 to raise over 65,000 Euros for the antennas. Individual radio amateurs from around the world donated generously as did several organisations such as AMSAT-UK and the RSGB. The transmitter will be installed in the Columbus module in the coming months. It can transmit DVB-S signals on 2422.0 MHz or 2437.0 MHz at either 1.3 Msps or 2.3 Msps with 10 watts of RF output. In addition to school contacts the equipment is capable of transmitting other pre-recorded video up to 24 hours a day to allow ground stations tuning.